Add 1/4 cup red wine to bottom of slow cooker pot. Cut ends off onion. Cut onion in half, and cut each half into four equal pieces. Place 4 pieces of onion at the bottom of the slow cooker. 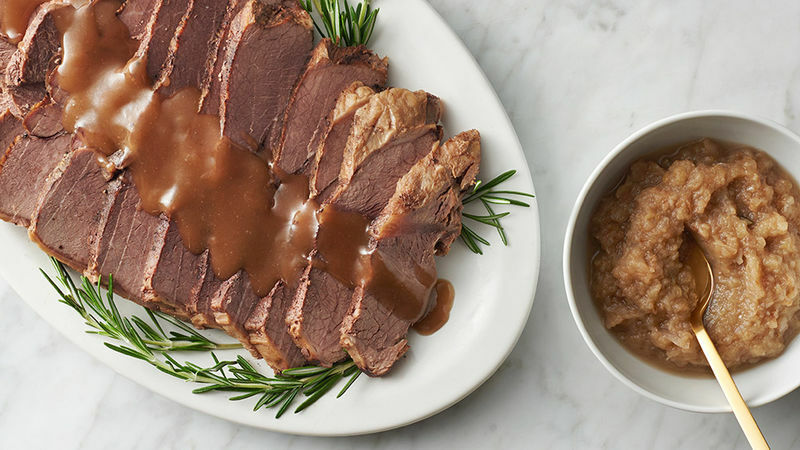 Place pot roast on top of onions, then arrange remaining 4 onion sections around the roast. Wash, core and quarter apples, leaving skins on. Arrange apple quarters around roast. Rub top and sides of roast with olive oil and sprinkle liberally with your favorite seasoning salt blend (or with salt and pepper), to taste. Top roast with rosemary sprig(s). Cover and cook on HIGH for 6 hours (or 12 hours on low). Remove roast from pan to a warmed platter and cover with foil. Let sit for 5 minutes. Meanwhile, carefully remove pan from slow cooker base and pour liquid through a fine sieve. Discard apple-onion pulp (or serve on the side, hot, like applesauce) and return the clarified liquid to the slow cooker and continue heating, uncovered. In a small prep bowl, mix 1 tablespoon cornstarch with 2 tablespoons cold water until smooth and lump-free. Add cornstarch and water to the slow cooker and whisk constantly to combine with cooking liquid until the mixture has thickened and sauce has formed. Pour sauce over meat on platter and serve immediately.